K30 Elderly Watch Tracker GPS Watch Locator GPS+LBS+WIFI Positioning Anti-lost Sports Tracker SOS One Key for Help Tracker Watches Gps Tracker. 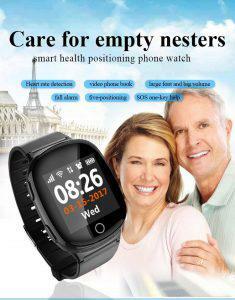 Watch, cell phone and GPS Tracker. It works like a mobile phone accepts up to three SOS numbers and make it discoverable on a 24-hour basis. 6. Medication reminder: Set the time to Take medicine in the APP. 8. Two-way phone call: Phone bool dialing, two-way call. Please read carefully the instruction manual before use for quick start. Product appearance and color is subject to material object! Select SIM card of GSM network, must have 2g data traffic. Refer to the opinion of distributor. (Please turn off the watch when installs the card). SIM card of watch should activate GPRS function and caller ID display function. Install APP client in the mobile phone; inquire about your distributor for client details. Two-dimension code is used for user registration. Scan the following two-dimension code to download Android and IOS mobile phone Client (please select security guard). Scan 15-digit registration code or manually input the registration code to register. Registration code is unique and can`t be registered repeatedly. FAQ(1):Input wrong registration code, may input id or IMEI. (2):Registration code has been used and should be restored and then use. (3):Account number has been registered, should change the account number or restore the account number. (4):Retrieve password: Password can be retrieved using registration code and account number, also can be retrieved using the mailbox when you register or the mailbox which is filled in the personal information. After completing the registration, input correct account number and password in the login interface, click to log in and enter main interface. 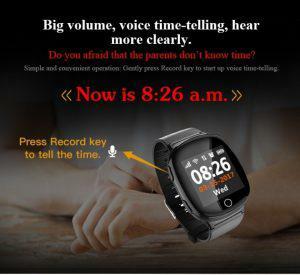 ⑴WeChat:Realize the voice dialog of watch and app. App sends voice: After starting sound recording, app begins sound recording and sends to the watch, the longest voice is 15 seconds. After the watch receives the voice, watch interface has prompt, click to play the voice. Sound recording of watch: Touch screen or shortcut key to enter We Chat interface, long press intercom icon or shortcut key to record, release to send the record to app; when App receives the voice, it will give notice. 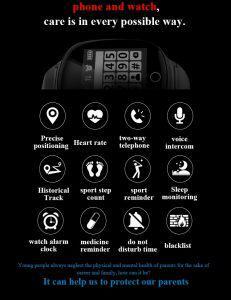 (2)Call: Enter the dialing interface of mobile phone, is unrelated to the watch. (3)Phone book: Familiarity number, set up 30 familiarity numbers for the watch. (4)Medicine reminder: Set up medicine taking text or voice reminding for the watch in divided period. (5)Health: View the current and historical data of corresponding step counts, overturn and heart rate. ⑹Positioning:View the watch position in real time. Map interface can display the position of all the devices and app mobile phone, switch the current device, click “positioning”, the watch begins to fix position for 3 minutes in real-time, upload interval is 20 seconds, restore to default work mode after 3 minutes. In the map interface, you can know the positioning method of watch in real time. When positioning icon is red, it is gps positioning, blue is base station positioning, green is wifi positioning, i.e.network positioning. In the map interface, switch to We Chat, call, health, railing and other interfaces. ①Trace: Inquire about historical trace of watch according to time range. Base station switch of the interface refers to the switch for displaying base station position point when inquires about the trace. Turn off the trace, it doesn`t display base station positioning point; turn on the trace to display base station positioning point. ②Security zone: Minimum radius of railing is 200 meters. When the user comes from inside of railing to outside and conducts positioning, it would give the railing alarm. Only one electronic railing can be set up. 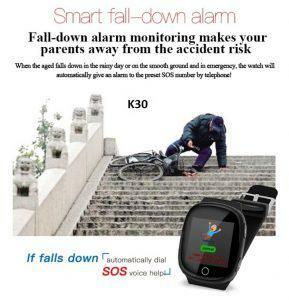 Mine: Set up information and parameters of the watch.①Set up SOS numbers: It can set up 3 numbers; the watch presses SOS key for 3 seconds and gives an alarm in an emergency, dial 3 numbers in a loop. If there is no answer, dial two loops.②Voice monitoring: It is generally set as parents’ number; after enabling monitoring, the watch actively dials the setup number, the watch can’t hear the sound of mobile phone, mobile phone can hear the surrounding sound of the watch.③Do not disturb time period: Within do not disturb time period, the watch can’t receive any call.④SMS reminder settings: Low battery, sos, take down 3 alarm SMS switches, send the alarm SMS to the number which is set up in the watch. Alarm SMS is charged according to normal SMS; after setting up the number, it is defaulted as voice monitoring.⑤Profiles: 4 modes, vibration and ring, ring, vibration, silent.⑥Work mode: 3 basic work modes (normal mode, power saving mode and real-time positioning mode); different work modes have different upload intervals. Normal mode: Upload interval is 600 seconds Power saving mode: Upload interval is 3600 seconds Real-time positioning: Upload interval is 60 seconds⑦Watch alarm clock: It can set up 3 alarm clocks; can set up alarm clock method according to own needs.⑧Find device: The watch is not at hand; send the instruction, the watch would ring for one minute so that convenient for finding, press the key to stop ringing. ⑨Device list: Device ID of children and the aged can be switched; after switching, it can change into current settings for control. ⑩Remote power-off: After the watch powers on and works normally, it can’t press the key to power off, only can power off remotely using app. Information center: Click to view the alarm information record of the watch. For brief explanation of other relevant functions, refer to “About Us and Help”; the customer can enter to understand. Notes: You can view ID registered by the customer in the device list; if the ID is inconsistent with ID stuck on the watch, the watch can’t connect app. 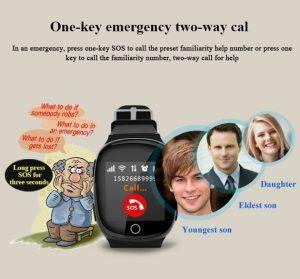 4.1.1 sos emergency alarm: Long press sos key for 3 seconds, watch screen displays sos, the watch enters the alarm status, dial 3 sos numbers in two loops. If the telephone is put through, it would not continue to dial; if there is no answer, it keeps dialing until completes two loops. The watch can send SMS to the monitoring number (default is off), send alarm notice to APP at the same time. 4.1.2 Record ingkey function: When the watch is in the standby interface, long press the key to directly enter the sound recording interface; at this time, long press sound recording, release to send; press once to tell time in a voice. 4.1.3 Up key function: When the watch is in the standby interface, press the key once to directly enter the volume adjustment interface, at this time, it is volume up key. When the watch is in phone book interface, it is up key; long press to dial familiarity number 1. 4.1.4 Down key function: When the watch is in the standby interface, press the key once to directly enter phone book interface, it is down key. When the watch is in the volume interface, it is down key, long press to dial familiarity number 2. 4.2.1 Main interface: First line small icon is gsm signal, ring mode (icon is not displayed), voice sign, positioning icon, networking sign and battery sign. Below are time (Gregorian calendar), date, weather and temperature. 4.2.2 Dialing: Input the number manually for dialing and calling. 4.2.3 Phone book: Click to see 30 numbers set up by app, turn the page left and right to click dialing. 4.2.4 We Chat: Realize We Chat of APP and watch; in the sound recording interface, long press to record, release to send the record. 4.2.5 Traditional opera: Enter the music player interface and play the built-in traditional opera excerpts for leisure pastime of the aged. steps; after there is number, click the interface to see the steps. 4.2.6.1Sports reminder: Turn on step counts, enable sports reminder switch. If step counts don`t exceed 1000 steps, remind you of sports from 5 p.m. every day. remind the aged of standing up and exercising. 4.2.8Volume: Adjust the volume of the system. When the watch is turned on for the first time, it can`t connect to the server; app sends instruction to display that the device is not online. (1)Check whether SIM card of watch is gsm network, for example, the watch doesn`t support China Telecom. (2)Check whether SIM card of watch is activated data traffic, must be compatible with 2g data traffic, the watch only can use 2g data traffic currently. (3)Check whether server parameters (IP, port and ID) are correct, must guarantee that ID bar code stuck on the watch is consistent with read-in ID when the watch leaves the factory. The customer can edit SMS (pw,123456,ts#) using the mobile phone and send to the watch for viewing the watch parameters (the watch must install the card and power on, SMS must be input using English input method). If you have any question, inquire about the agent. (4)If can`t register, there are two conditions: a. Prompt that device number doesn`t exist or device number has been registered, must ask the agent for handling. b. Prompt that the account number has been registered, the customer can register again after changing one account number.